It's important to remember that this isn't your typical oktoberfest lager. It's an ale (amber ale) with oktoberfest style ingredients. Magic Hat is well known for making slightly odd-ball brews with flavors you normally wouldn't see in beers. 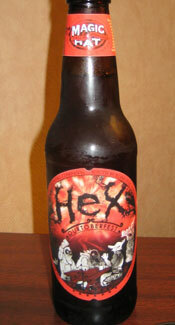 Hex fits in very well to their lineup of strange brews. This "hybrid" oktoberfest or as they put it "Ourtoberfest" is a mild beer that tastes mostly like a Marzan with it's sweet flavors and buscuity maltiness. There is only a slight hint that this beer isn't a lager as the hops make the beer a little dryer than what you would normally see in an oktoberfest marzan style lager. The is also a special ingredient they fail to mention. I personally think it's some sort of melon but you will have to taste to determine for yourself. The flavors are quite mild making this is a worth session beer. I would have liked a little less carbonation, more flavor and a little more balance to the sweetness but overall it's a decent beer that I will certainly buy again. Cheers! Appearance: Pours an attractive crystal-clear, golden-amber hue. The two finger, off white head that looked so nice when pouring the beer dissipates rather quickly leaving behind a creamy film on the beer. There didn’t seem much to any lacing. The one aspect of this beer that does stand out is the carbonation; even with a heavy pour the carbonation bubbling off the bottom of the glass is very noticeable. Smell: Smell is what you expect from an Oktoberfest; sweet,toffee, malty and biscuity. The smell is nice and strong which I believe is due to the heavy carbonation. There is also a hint of something else in there, a fruity/melon scent. It’s not prominent but if you look for it you’ll notice it. Initial Taste: The taste is one of familiarity as it tastes a lot like the other craft oktoberfests on the market. However there are a couple discernible differences. Starts off mild and sweet with toffee and caramel flavors dominating the palate. There is a slight hoppy bitterness that helps gives some energy to the sweet flavors. The carbonation is still pretty heavy taking away the smooth creamyness that this beer could have had lots of. The scent of melon (maybe cantaloupe) has made it’s way into the flavor as well. It’s a funky flavor that is extremely hard to pin down. It doesn’t hurt the beer by any means, instead it adds a little mystery which makes you want to keep tasting it. The finish is a little dryer than I would have liked. Thoughts:It’s important to remember that this isn’t your typical oktoberfest lager. It’s an ale (amber ale) with oktoberfest style ingredients. Magic Hat is well known for making slightly odd-ball brews with flavors you normally wouldn’t see in beers. Hex fits in very well to their lineup of strange brews. This “hybrid” oktoberfest or as they put it “Ourtoberfest” is a mild beer that tastes mostly like a Marzan with it’s sweet flavors and buscuity maltiness. There is only a slight hint that this beer isn’t a lager as the hops make the beer a little dryer than what you would normally see in an oktoberfest marzan style lager. The is also a special ingredient they fail to mention. I personally think it’s some sort of melon but you will have to taste to determine for yourself. The flavors are quite mild making this is a worth session beer. I would have liked a little less carbonation, more flavor and a little more balance to the sweetness but overall it’s a decent beer that I will certainly buy again. Cheers! I just had to pick up some more Hex over the weekend after you introduced me to it a few weeks ago. It’s certainly my favorite of all the Magic Hat’s that I’ve tried so far… I wish it would stick around! @Devin – I’m glad you liked it man. It’s a real easy drinking beer. And I agree…it’s pretty much the only beer from Magic Hat I’ve liked so far.